Voted the best beach and it is FREE! Short walk to the waters edge. LOCATION, LOCATION, LOCATION. Luxurious 3 bedroom condo. ***Come see what is new for 2019. New carpet! New family room furniture! Updated paint! *** And a new porch awing to enjoy the great outdoors from you own privae balcony. This newer 3 bedroom 2nd level condo has it all! Be sure to read the reviews posted by past renters! Located at the corner of 11th Avenue & Surf Avenue in quiet North Wildwood within 1 and 1/2 short blocks to the beach (water close, no long beach walk to water! Closest walk to the water in all of the Wildwoods!) About 4 more blocks to the beginning of the boardwalk-- close enough to walk to all of the action, but far enough away from the lights and the noise that you can get a good night's sleep. Enjoy the view of the ocean (down street) as well as the Friday night fireworks from your own private deck off of the living area with outdoor furniture. No pets! This is a Smoke-Free unit. Great for two families to share or one large extended family—Oversized unit with 1700 square feet-- room to spread out. The master bedroom has a queen bed, twin day bed with twin trundle and full bath- sleeps 4. Bedroom #2 has a full bed and twin bed- sleeps 3. Bedroom #3 has a full bed and twin bunk beds- sleeps 4. TVs are provided in each bedroom. There is a full hallway bathroom. Full size washer and dryer in private laundry room located in the hallway near the bedrooms. All beds come with comforters and pillows. We ask that you supply your own sheets, pillow cases, and towels. Enjoy our fully equipped kitchen with all appliances and amenities –refrigerator/freezer with ice maker, dishwasher, built-in microwave, self-cleaning oven, toaster, blender, coffee maker, Keurig coffee maker, dishes and glassware, pots, pans, etc. Everything! Oversized dining room table seats 8. Kitchen table seats 4. Bar seats 4 and counter seating for 3. There are 2 off street parking spots with this unit-- Parking for one car in the driveway and one car in the garage with room for extra storage in the garage. For your convenience we provide 2 beach chairs, a wagon, sand toys, beach umbrella, and boogie boards. Private propane gas grill provided. There is plenty of additional FREE street parking in this area. Wireless internet access (May-September). 50 inch HD TV in main living area along with TVs in each bedroom. Half rental fee due with contact to book your week-- Balance plus security due 30 days before arrival. Personal checks or money orders accepted. No hidden fees. My husband and I own several rental condos/townhouses in North Wildwood. If your week is rented inquire about our other units. Great location. Quiet, peaceful neighborhood. Walking distance to beach and boardwalk without all the noise. Top floor with ocean view. Very large...oversized unit. Lots of room to spread out...Open floor plan. Unit has new carpet, new hardwood floors and just added awing that covers our top deck so you can enjoy the sun without getting cooked! All new patio furniture makes our home even more enjoyable. Two full bathrooms with tub over showers. Ocean can be seen in the distance from our deck. driveway parking spot and free street parking on our street. One car garage with storage. Internet provided from May-September. It is not available in our highly discounted Oct. to April months. In most bedrooms and living room. Unit has two sets of inside steps. Located on the top floor. Air Conditioning,full size washer and dryer, fully stocked kitchen,ref.,dishwasher, microwave, garage storage, games, puzzles, Large flat screen TV, oversized living room and dining room, 1700 square feet of living space, lots of room to spread out, walking distance to beach and board walk, family rental, free beaches and parking,cooler, beach chairs, wagon, stroller, high chairs and pack and play provided. Also, thank you for taking great care of our home. You are welcome back anytime. 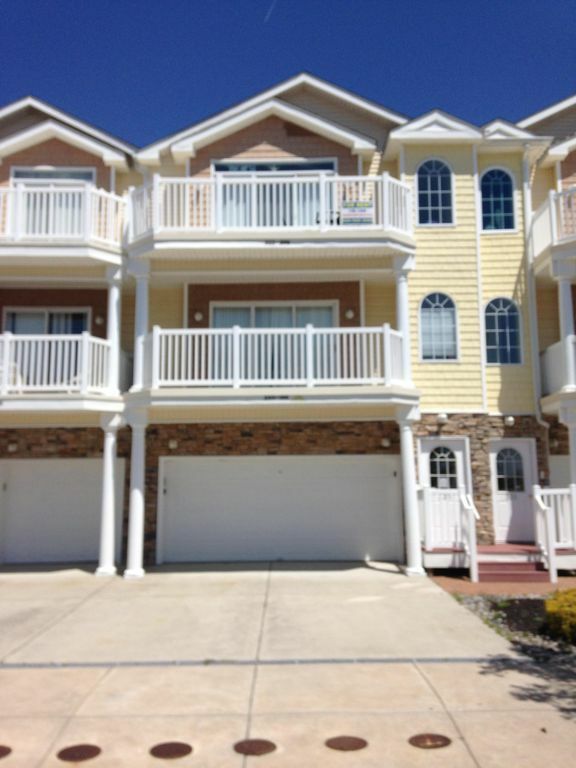 We have rented several condos in North Wildwood and this one is at the top. The kitchen was very well stocked (including a smoothie machine!) and the fridge was big enough to hold enough for our group. The beach chairs, umbrellas and beach cart were very much appreciated. The outside shower came in handy during the after the beach rush. The grill was a welcome addition to our dinner plans. Teresa and Dave replied to emails right away and made sure we had everything we needed. The condo is walking distance to several restaurants including Russo's (the best cheesesteak and italian hoagies), Owens pub (check out trivia night on Wednesdays!) and the Establishment (a foodie haven, the best food in Cape May County! Don't miss their scallops, cardamon carrots and Mr. Pink cocktail). We would definitely rent this condo again. Thank you so much for your rental and great review! We will need to check out the "Establishment " as we have not made it there yet! You and your family would be most welcome to return any time. Thank you for leaving our home in perfect, arrival condition! Our family of 11 vacationed in this unit very comfortably. The unit was impeccably clean upon moving in and it is apparent that the owners are well organized and they take pride in the upkeep and look of their property. It truly was a pleasure dealing with the owners. They were very accommodating and quickly responded to our email inquiries throughout the process. I would definitely rent this unit again. Terri and Dave....thank you for everything. We do try hard to make sure our renters have a spotless house and everything they needfor their vacation. We would like to thank you for leaving our home perfect. Our whole family totally fell in love with the conde. For my wife and I, it was our second time and we knew how comfortable our stay would be. Everything was clean and well-maintained. It's very close to the beach and the boardwalk (5 min walk). David and Teresa are always available if we need anything. Thanks again! Beautiful condo. Very comfortable. This place has everything you need to enjoy your stay. Owners are always available if needed. I would highly recommend it. My family had so much fun going to beach, playground, Boardwalk and various restaurants. We are very happy that you enjoyed your stay at our home. I was very impressed with our rental property. It was beautifully furnished and clean. My grandson called me when he got there and said, "Mom mom, It's so beautiful I want to cry. Can we live here?" When I arrived later that evening, I was throroughly impressed and we had a wonderful week at the shore. Thank you for taking the time to give us a review! We really appreciate it! I love your grandson's reaction. :) So sweet... It made me smile. We try very hard to make sure your rental is as advertised and perfect for your arrival. Feedback like yours makes it all worth while. Again, thank you for your rental, leaving our unit perfect and taking time to give us this great review. Minature golf, bicycle riding, boat rides, dolphin watching, wave runner rentals, kayak rentals, fireworks, indoor and outdoor water parks plus much, much more. Renters will need to sign a rental contract which will be emailed after payment is received. This should be signed and emailed back to the owners within 7 days of rental confirmation.